I have known for a little while that I need to start expanding my review footprint south into Luzerne county, but I knew I really needed to get moving when my feature on PA Live described my blog as mostly in Scranton. 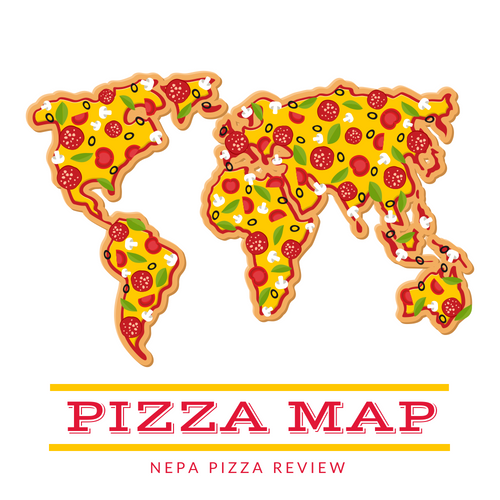 My goal is to eventually serve all of NEPA, and to enjoy all of the wonderful pizzas that each town in the 570 offers! 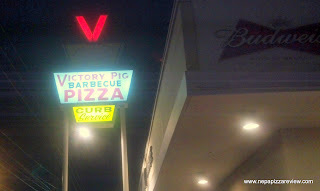 So on this day, I took to Twitter, and a reader quickly responded that I should go to Victory Pig, so off I went. I don't know what i was expecting when I arrived at VP, but I certainly was surprised by the setup of the restaurant. It almost looked like a 50's-type diner with curb-side service, which is a real throwback. Where my right hand pizza connoisseur and I were intrigued by the different environment, we thought it best that we take the pizza to go. I will say that the service was really quick and it seems like barbeque might be their main dish, because pizza is only served on Wednesdays, Fridays, and Saturdays. When we ordered our slices, we were informed that the pizza comes with onions by default, so we decided to just go with the flow and order the pizza with the onions. As soon as I opened the box, I knew this pie was a serious pizza, as it reminded me of Ernie G's in Avoca. It was very thick, had a bright red tomato sauce and mozzarella cheese on top. I struggle with what to call this type of pizza which seems to be pretty prevalent in this area, maybe I'll call it "deep fried sicilian" because of the heavy oil that is put in the bottom of the pan. Either way, I've gained quite an appreciation for this genre of pizza, despite its probable health implications. My colleague and I put the VP pie to the test and found the crust to be absolutely outstanding. 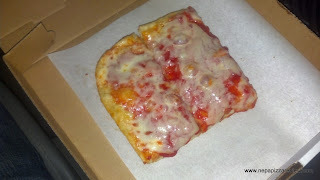 It was a light fluffy crust that was weighed down by the oil, but not so heavy that it sits in the pit of your stomach. The thing that I liked most was the healthy crunch that was just out of this world. The sauce itself had a very nice consistency and flavor, but the chopped onions sprinkled under the cheese really overpowered the light sauce to a point where the flavor was a bit offensive. I typically like onions in my sauce, but this was just too much, and threw the balance of the pie off. Finally, the cheese was very good quality, but the two of us felt that it was a little sparse, and could have used a bit more generous portion on top. Overall, this team was very satisfied with the pizza, and if I wasn't still tasting the onions 3 hours later as I type this, Victory Pig would have probably earned the highest marks possible. (In the scoring below, I had to deduct for the onions, so I did so from overall taste, because the sauce itself was very good). 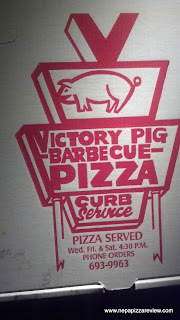 Also check out a very thorough history and review of Victory Pig from The Keystone Pizza Critic! 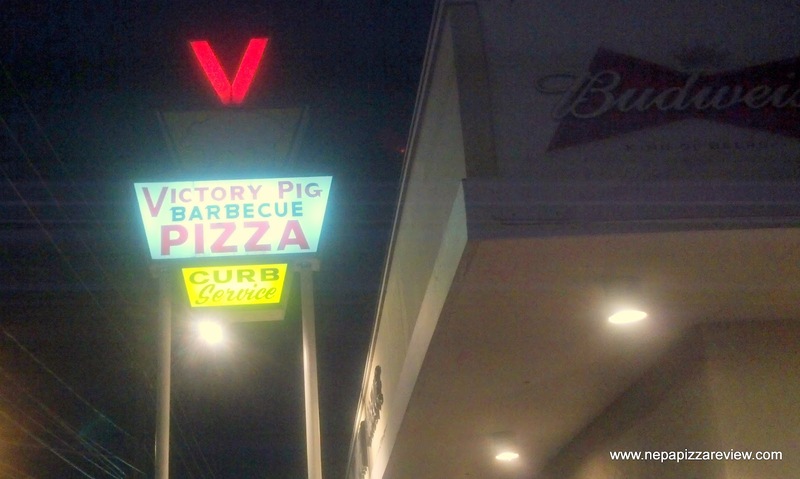 Victory Pig is definitely a different place to eat, and I'd nominate it for Diners, Drive-Ins, and Dives for sure. The pizza really delivers the goods, just be sure you specify with or without onions depending on your tastes! Simply put... great pizza. Not many like a fried pizza, but if you do this is the grand daddy of them all. Been going here since I was a wee one and always enjoy it. Although, I have to admit, I get mine without onions. Still one of the few places you can get a carton of orange drink or chocolate milk with your pizza. "Either way, I've gained quite an appreciation for this genre of pizza, despite its probable health implications." Haha my wife asked me once if I knew that by never eating pizza again it would add 10 years to my life would I do it...I didn't even have to think about it for a second. God this site makes me hungry...I wonder if there are any 24/7 pizzerias in PA lol.